As a policy matter moreover, we reject the use of military force where well-established law enforcement authorities in this country provide the best means for incapacitating a terrorist threat. Specifically, Holder did not say “we are legally constrained by the Constitution from depriving people of life, liberty or property without due process of law, and from using military force on U.S. soil”. Instead, he said that the Obama administration was so far abstaining from using a power it already has as a current “policy” decision. The concluding legal opinion represents a radical betrayal of constitutional limits imposed on the state for depriving citizens of life, liberty and property. Officially now, Obama’s kingly authority to play Judge, Jury, and Executioner and deprive Americans of their life without due process of law applies not only to Americans abroad but to citizens that are inside the United States. “The US Attorney General’s refusal to rule out the possibility of drone strikes on American citizens and on American soil is more than frightening – it is an affront the Constitutional due process rights of all Americans,” Sen. Paul said in a statement. Holder, along with the Obama administration, is making it seem as if the President’s use of lethal force, as in the drone war, would only be used in circumstances like another impending 9/11 attack or something. Only when an attack is imminent. But that categorical limitation on the President’s authority to kill depends upon their definition of “imminence,” which we learned from a leaked Justice Department white paper last month, is extremely broad. The memo refers to what it calls a “broader concept of imminence” than what has traditionally been required, like actual intelligence of an ongoing plot against the US. “The condition that an operational leader present an ‘imminent’ threat of violent attack against the United States does not require the United States to have clear evidence that a specific attack on U.S. persons and interests will take place in the immediate future,” the memo states, contradicting conventional international law. Boy, do I feel comforted. For more than a year and a half, the Obama administration has said it could target American citizens for assassination without any trial or due process. But now, as shown by the debates surrounding indefinite detention, the government is saying that America itself is a battlefield. U.S. citizens are legitimate military targets when they take up arms with al-Qaida, top national security lawyers in the Obama administration said Thursday. The government lawyers, CIA counsel Stephen Preston and Pentagon counsel Jeh Johnson … said U.S. citizens do not have immunity when they are at war with the United States. Johnson said only the executive branch, not the courts, is equipped to make military battlefield targeting decisions about who qualifies as an enemy. The courts in habeas cases, such as those involving whether a detainee should be released from the Guantanamo Bay detention facility in Cuba, make the determination of who can be considered an enemy combatant. We pointed out a year ago, the director of the FBI said he’d have to “check” to see if the president had the authority to assassinate Americans on U.S. soil. We reported last October that form Department of Justice lawyer John Yoo – the guy who wrote the memo justifying torture, even of children, which was used to justify torture of innocent people, including children – said that the president has the power to assassinate Americans on U.S. soil in times of war. In a Google+ Hangout last month, President Obama refused to say directly if he had the authority to use lethal force against US citizens. As Mother Jones reported at the time, the reason the president was being so coy is that the answer was likely yes. Now we know that’s exactly what was happening. It is not very reassuring that the same unaccountable agency which decides who should be killed by drones also spies on all Americans. And it is counter-productive in an age when the government – instead of doing the things which could actually make us safer – are doing things which increase the risk of terrorism. Read this if you have any doubt as to how much liberty Americans have lost. The response by Holder could lead to a situation where “an Arab-American in Dearborn (Mich.) is walking down the street emailing with a friend in the Mideast and all of a sudden we drop a drone” on him. He said it was “really shocking” that President Barack Obama, a former constitutional law professor, would leave the door open to such a possibility. True … but you don’t have to be Arab-American to get in trouble. Oldspeak: “My Administration has worked tirelessly to forge a durable legal and policy framework to guide our counterterrorism operations. Throughout, we have kept Congress fully informed of our efforts. I recognize that in our democracy, no one should just take my word that we’re doing things the right way. So, in the months ahead, I will continue to engage with Congress to ensure not only that our targeting, detention, and prosecution of terrorists remains consistent with our laws and system of checks and balances, but that our efforts are even more transparent to the American people and to the world. –President Barack Obama, Feburary, 2013. “While four American citizens are known to have been killed by drones in the past decade, the strikes have killed an estimated total of 2,600 to 4,700 people over the same period. The focus on American citizens overshadows a far more common, and less understood, type of strike: those that do not target American citizens, Al Qaeda leaders, or, in fact, any other specific individual. In these attacks, known as “signature strikes,” drone operators fire on people whose identities they do not know based on evidence of suspicious behavior or other “signatures.” According to anonymously sourced media reports, such attacks on unidentified targets account for many, or even most, drone strikes. Despite that, the administration has never publicly spoken about signature strikes. Basic questions remain unanswered. The administration has rebuffed repeated requests from Congress to provide answers – even in secret.” –Cora Currier and Justin Elliott. One of these things is not like the other. The nomination of John Brennan to be CIA director has prompted intense debate on Capitol Hill and in the media about U.S. drone killings abroad. 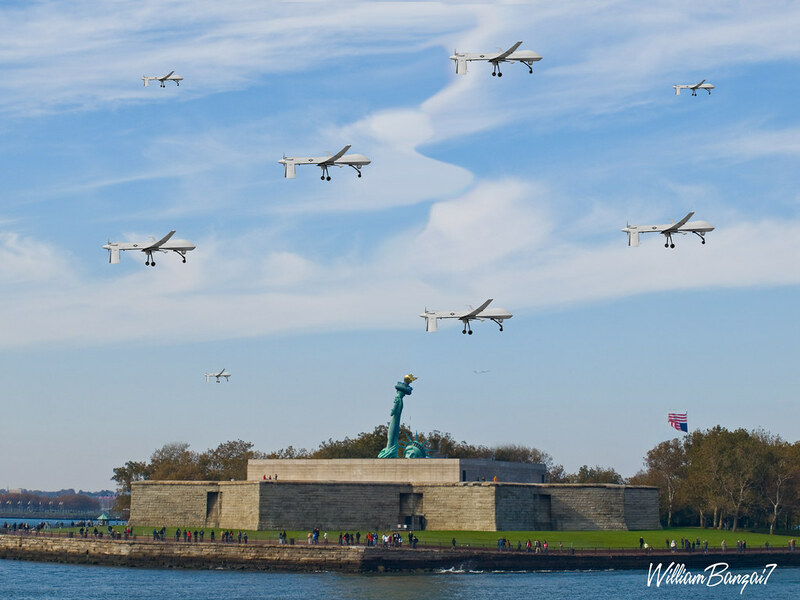 But the focus has been on the targeting of American citizens – a narrow issue that accounts for a miniscule proportion of the hundreds of drone strikes in Pakistan and Yemen in recent years. Consider: while four American citizens are known to have been killed by drones in the past decade, the strikes have killed an estimated total of 2,600 to 4,700 people over the same period. The focus on American citizens overshadows a far more common, and less understood, type of strike: those that do not target American citizens, Al Qaeda leaders, or, in fact, any other specific individual. In these attacks, known as “signature strikes,” drone operators fire on people whose identities they do not know based on evidence of suspicious behavior or other “signatures.” According to anonymously sourced media reports, such attacks on unidentified targets account for many, or even most, drone strikes. Despite that, the administration has never publicly spoken about signature strikes. Basic questions remain unanswered. What is the legal justification for signature strikes? What qualifies as a “signature” that would prompt a deadly strike? Do those being targeted have to pose a threat to the United States? And how many civilians have been killed in such strikes? The administration has rebuffed repeated requests from Congress to provide answers – even in secret. “How, for example, does the Administration ensure that the targets are legitimate terrorist targets and not insurgents who have no dispute with the United States?” asked three senior Democrats on the House Judiciary Committee in a letter to Attorney General Holder last May. The legislators sent a second letter in December. Republicans on the committee joined in sending another letter this month. All have gone unanswered, according to committee staff. Sen. John McCain, R-Ariz., recently sent his own letter to Brennan asking several pointed questions on signature strikes. “How do ‘signature strikes’ square with your statement that targeted killing operations are only approved when a targeted individual poses a ‘significant threat to U.S. interests?’” McCain asked, quoting a speech Brennan gave on drone strikes last April. “How can the Administration be certain it is not killing civilians in areas, like many parts of Yemen and Pakistan, where virtually all men, including civilians, carry weapons?” the letter continued. A McCain spokesman said the senator had not received a response. The White House declined to comment for this story. When Obama administration officials publicly address drone strikes, they focus on thwarting imminent threats and targeting Al Qaeda leaders, including U.S. citizens. Brennan, for example, said at his confirmation hearing that a lethal strike only occurs when “the intelligence base is so strong and the nature of the threat is so grave and serious, as well as imminent, that we have no recourse.” He was talking only about strikes targeting U.S. citizens, not signature strikes. Sen. Rand Paul, R-Ky., is now threatening to filibuster Brennan’s nomination until he answers questions on the U.S. citizen issue. And the Justice Department “white paper” leaked to NBC this month outlines the legal rationale for drone strikes, but only in cases when they target U.S. citizens who are also Al Qaeda leaders. The first public reference to a signature strike appears to have been in February 2008, when the New York Times reported a change in drone strike policy, negotiated between the U.S. and Pakistan. “Instead of having to confirm the identity of a suspected militant leader before attacking, this shift allowed American operators to strike convoys of vehicles that bear the characteristics of Qaeda or Taliban leaders on the run, for instance, so long as the risk of civilian casualties is judged to be low,” the Times reported. Over the next few years, they became the majority of strikes conducted in Pakistan, according to media reports citing unnamed officials. The new policy contributed to an increase in strikes in Pakistan – up to a high of about 120 in 2010 – and also to an increase in the number of low-level militants or foot soldiers killed, according to a New America Foundation analysis. It’s not clear how much evidence is needed to justify a strike. In media reports, U.S. officials have offered scenarios of signature strikes hitting training camps or fighters who might cross the border from Pakistan to Afghanistan. The CIA reportedly uses drone surveillance and other intelligence to try to ensure those targeted are in fact militants. It is also next to impossible to say which attacks are signature strikes. The outcomes of strikes are often disputed. In one apparent signature strike two years ago, unnamed U.S. officials told the Associated Press that they had targeted a group that “was heavily armed, some of its members were connected to Al Qaeda, and all ‘acted in a manner consistent with AQ (Al Qaeda)-linked militants.’” The U.S. said about 20 militants were killed. But Pakistani officials said it had been a meeting of tribesmen and villagers provided evidence to the AP that 38 civilians were killed. According to the Wall Street Journal, the attack prompted a debate in the White House about whether signature strikes and strikes on low-level fighters were worth the diplomatic risks. The pace of strikes in Pakistan has tapered off since 2010, in large part because of deteriorating diplomatic relations with Pakistan, according to Bill Roggio, who tracks strikes for the Long War Journal. The idea of killing members of an enemy force without knowing their identities isn’t itself controversial. “In a traditional conflict, there is no requirement that you know every single person’s identity before you strike, so long as there are reasonable grounds for determining that the target is part of the enemy force,” said Jennifer Daskal, a professor at Georgetown Law School and a former attorney in the Justice Department during the first Obama administration. But legal observers hotly debate the bounds of the drone war, and who qualifies as a member of the enemy force. “In the conflict with a clandestine enemy like Al Qaeda, that determination is much harder,” said Daskal. While President Obama pledged in his State of the Union address to be more transparent about drone policy, the administration appears to maneuvering to avoid sharing additional information with Congress. According to the New York Times, the administration may opt to share information on last year’s Benghazi attack with Republican senators to avoid revealing any more legal memos on the drone war to Democratic senators. Intelligence Committee Chairwoman Sen. Diane Feinstein, D-Calif., has said that her committee reviews videos of strikes.But she also recently said that the committee has long sought all of the legal opinions on drone strikes – and that the administration has withheld most of the opinions. A temporary stop on the U.S. military’s power to imprison anyone deemed to have “substantially supported” terrorist groups was made permanent on Wednesday when U.S. District Judge Katherine Forrest ruled that journalists could be snatched up under the law. The ruling against a provision in the 2012 National Defense Authorization Act frustrates the government’s attempts to grant itself the ability to indefinitely detain anyone it could associate with terrorist activity, including domestic protesters. Truthdig columnist Chris Hedges had sued the Obama administration over the provision, along with journalists, scholars and political activists Noam Chomsky, Daniel Ellsberg and Naomi Wolf. Judge Forrest placed a temporary injunction on the provision in Section 1021 of the law in May. “This court does not disagree with the principle that the president has primacy in foreign affairs,” Forrest said in Wednesday’s ruling. But government arguments in favor of the provision were not convincing, she said. U.S. District Judge Katherine Forrest in Manhattan had ruled in May in favor of non-profit groups and reporters whose work relates to conflicts in the Middle East and who said they feared being detained under a section of the law, signed by President Barack Obama in December. Wednesday’s 112-page opinion turns the temporary injunction of May into a permanent injunction. The United States appealed on August 6. The permanent injunction prevents the U.S. government from enforcing a portion of Section 1021 of the National Defense Authorization Act’s “Homeland Battlefield” provisions. The opinion stems from a January lawsuit filed by former New York Times war correspondent and Pulitzer Prize winner Chris Hedges and others. The plaintiffs said they had no assurance that their writing and advocacy activities would not fall under the scope of the provision. Government attorneys argued that the executive branch is entitled to latitude when it comes to cases of national security and that the law is neither too broad nor overly vague. “This court does not disagree with the principle that the president has primacy in foreign affairs,” the judge said, but that she was not convinced by government arguments. A spokeswoman for the Manhattan U.S. Attorney’s office, which represents the government in this case, declined to comment on the ruling. The case is Hedges et al v. Obama et al, U.S. District Court for the Southern District of New York, No. 12-cv-331. We just won the lawsuit against Obama et al over the indefinite detention provisions of the fiscal 2012 National Defense Authorization Act. These provisions represented a blatant violation of due process and First Amendment rights, and plaintiffs argued that they were already having a chilling effect on journalists and activists. The NDAA included a clause which afforded the military the power to detain civilians — even Americans — indefinitely, without charge or trial, if they are accused of certain anti-state crimes or are accused of “substantially supporting” those accused of said crimes or forces associated therewith. If that sounds tortuous and nebulous it’s because it is: What the heck does “substantially support” or “associated force” even mean? You can urge Obama not to appeal the ruling by clicking here. Plaintiffs include Chris Hedges, Noam Chomsky, Daniel Ellsberg, Tangerine Bolen, and others; Demand Progress and RevolutionTruth members have raised more than $20,000 to support the lawsuit and used it to pressure lawmakers to revoke the provions in question. We lost a relatively narrow vote in the House a few months ago, and the Senate will take up amendments to end indefinite detention in coming weeks. We’re hoping the Senate will actually take this finding of unconstitutionality to heart and explicitly revoke the codification of the indefinite detention authority when the NDAA gets a vote in coming weeks. This ruling required great fortitude on the part of Judge Forrest: She was appointed by Obama just last year. After initially expressing concerns about the provisions in question — because they infringed on certain executive power, not because of all of the reasons above — Obama has consistently supported and defended them. He signed them into law under cloak of darkness on New Year’s Eve and has aggressively defended them in court. This’ll probably get appealed all the way up to the Supreme Court — but you can click here to urge Obama to stop protecting this awful law. The agreement would allow not only military trainers to stay to build up the Afghan army and police, but also American special forces soldiers and air power to remain. The prospect of such a deal has already been met with anger among Afghanistan’s neighbours including, publicly, Iran and, privately, Pakistan. It also risks being rejected by the Taliban and derailing any attempt to coax them to the negotiating table, according to one senior member of Hamid Karzai’s peace council. A withdrawal of American troops has already begun following an agreement to hand over security for the country to Kabul by the end of 2014. But Afghans wary of being abandoned are keen to lock America into a longer partnership after the deadline. Many analysts also believe the American military would like to retain a presence close to Pakistan, Iran and China. Both Afghan and American officials said that they hoped to sign the pact before the Bonn Conference on Afghanistan in December. 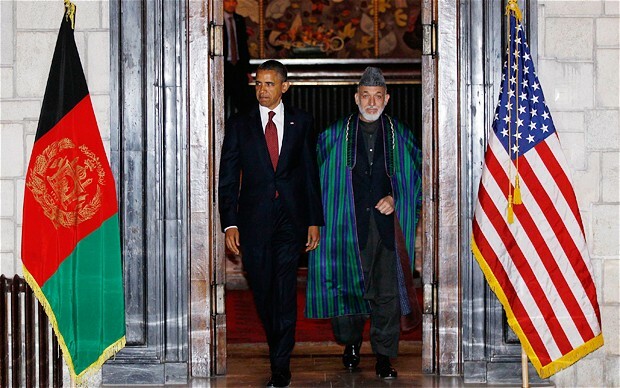 Barack Obama and Hamid Karzai agreed last week to escalate the negotiations and their national security advisers will meet in Washington in September. Rangin Dadfar Spanta, Mr Karzai’s top security adviser, told The Daily Telegraph that “remarkable progress” had been made. US officials have said they would be disappointed if a deal could not be reached by December and that the majority of small print had been agreed. Dr Spanta said a longer-term presence was crucial not only to build Afghan forces, but also to fight terrorism. “If [the Americans] provide us weapons and equipment, they need facilities to bring that equipment,” he said. “If they train our police and soldiers, then those trainers will not be 10 or 20, they will be thousands. Afghan forces would still need support from US fighter aircraft and helicopters, he predicted. 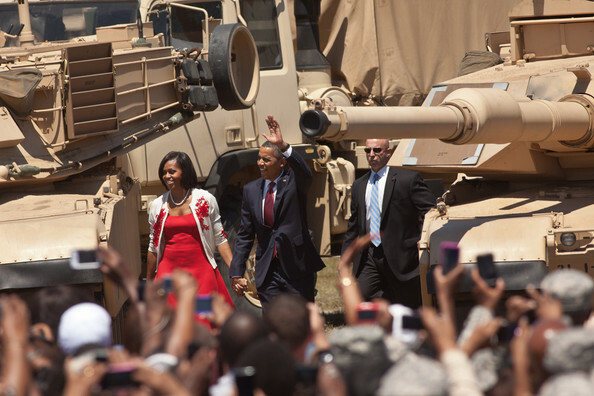 In the past, Washington officials have estimated a total of 25,000 troops may be needed. Dr Spanta added: “In the Afghan proposal we are talking about 10 years from 2014, but this is under discussion.” America would not be granted its own bases, and would be a guest on Afghan bases, he said. Pakistan and Iran were also deeply opposed to the deal. Andrey Avetisyan, Russian ambassador to Kabul, said: “Afghanistan needs many other things apart from the permanent military presence of some countries. It needs economic help and it needs peace. Military bases are not a tool for peace. “I don’t understand why such bases are needed. If the job is done, if terrorism is defeated and peace and stability is brought back, then why would you need bases? A complete withdrawal of foreign troops has been a precondition for any Taliban negotiations with Mr Karzai’s government and the deal would wreck the currently distant prospect of a negotiated peace, Mr Avetisyan said.